Positioned just 7 minutes walk from lovely, sandy beaches Mermaid Rock Cottage is a charming fisherman's cottage offering independent self catering private family accommodation. From the sea facing deck spectacular sunrises and sunsets can be savored and BBQ enjoyed with a stunning view of False Bay and ArK Rock. Situated in Jackson Road, a quiet little street, a lovely walk from the picturesque seaside village of Simon's Town for shopping and fine dining at reasonable prices. Take a stroll down to Boulders Beach National Park famous for its Jackass Penguin Colony or a breath taking walk up the Naval steps on Admirals Kloof, the mountain behind the cottage. Drive the scenic road south, down the peninsula, to the well known Cape Point Nature Reserve where you can get a magnificent view of the 2 oceans, Indian and Atlantic, merging. Enjoy a glass of Cape wine and a braai as you sit under the pergola on the deck, and gaze out to sea, you may catch a rare glimpse of the Mermaid of Ark Rock! Elspeth lives in Cambridge. She settled in London from Zimbabwe 28 years ago. She is a professional running her own Management Consultancy business, a mum and is committed to the philosophy and practice of yoga. She is an Iyengar Yoga teacher. Her cottage in Cape Town dates back to Elspeth's time studying at UCT in 1982 when it was acquired into the family and many happy times have been spent there over 36 years. We adore the quiet beauty of the area around Simon's Town and the lovely, unspoilt beaches and rugged walks immediately accessible out of the back door. The location is pretty, calm and safe; also easy to get to interesting, lesser known places anywhere on the peninsula. From the deck watching the sunrise or sunset across the sea is very special. By night we get a magical view of stars and glittering lights across the bay. The new pergola and braai facilities on the deck offer the opportunity of meals while enjoying glorious sunlight or moonlight playing on the sea, and the movement of the waves to get a sense of the weather conditions. Alternatively breakfast or dinner in the protected area means we enjoy being outside away from wind and sun. This False Bay sea is warm, lovely for swimming. Local penguins are a delight! We may choose a breath taking walk up to the water tower behind the Cottage or the Naval Steps a little way along Runciman Drive. The quiet road and safe neighbourhood mean the children may visit the local store or Simon's Town without us worrying. On cold winter nights its cosy with curtains drawn, heating on, chilling out on comfortable sofas, dipping into nice selection of DVDs and books, with the bonus of sea view - its great! Bathroom 2 has shower attachment on taps Both are large bathrooms with natural light, well tiled, wall mounted shelves and cupboards, and railings for drying towels. Lounge with comfortable sofas, coffee table, TV and double patio doors leading to breakfast area outside. Large expanse of windows with view to the sea, lots of natural light. The lounge contains the separate dining area. Fully equipped with cooker, hob, fridge, freezer, microwave, washing machine, dishwasher, toasted sandwich maker, kettle, toaster, crockery and cutlery, plus utility cupboard. The Simon's Town Golf course is 10 minutes away by car or a nice walk. The house was very nice. Great views and it had everything we needed. We made our own breakfasts and the kitchen was perfect. Barry, the caretaker, responded to any queries we had and provided us with good restaurants. Will recommend! Enjoyed our stay in this peaceful location with lovely views over False Bay and easy walking distance to Boulders Beach and into Simon’s Town. We thoroughly enjoyed our stay at Mermaid Cottage. Everything was just right and the only complaint was the constantly strong southerlies which were a bit of a surprise! We had lovely walks around Simon's Town and visits to explore the Cape Point national park. We would very happily book again. Also to mention we found the letting agency to be most helpful with everything. Thank you Michael I'm delighted you explored Cape Point and enjoyed walking, we love these too. I'll pass your comments on to Barry and Karon at Engel & Voelkers. You are welcome, Mermaid Rock awaits your next visit! We are a swedish family of five that spent 3,5 weeks at this lovely place. Simon's Town and Mermaid Rock Cottage was a perfect "base-camp" for us. The Cottage is so well kept. Everything was clean and nicely in order when we arrived, it felt very welcoming. The service from Barry and Karon at Engel & Voelkers has also been very good, they always answered e-mails and phone calls immediately. We hope to come back soon again! I'm so pleased you had wonderful weeks in the Cottage! and Simon's Town was a perfect "base-camp" for plenty of family time and surfing too. Looking forward to having you stay again. 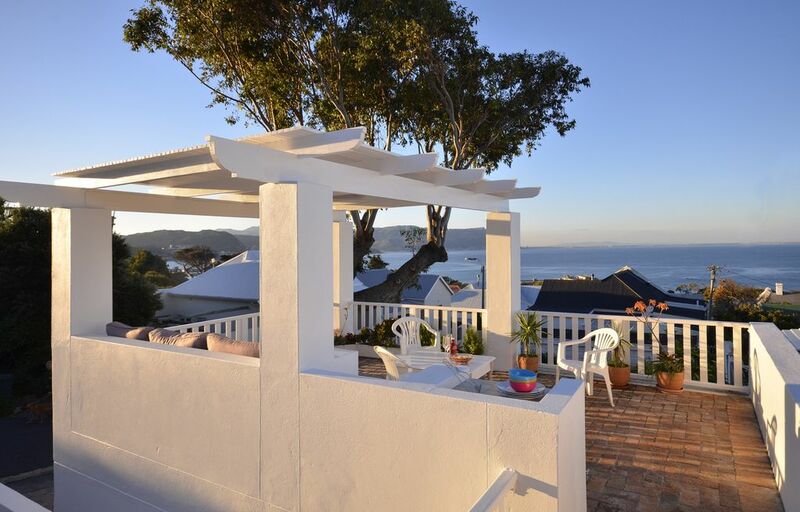 This is a beautiful property with a fantastic sea-view and overlooking much of Simonstown. The location is excellent, 40 min from Cape Town and about the same to Cape of Good Hope. You find beautiful beaches after a 10-15 minutes nice walk and only 3 min away by car. The Town Centre is 5 min away by foot with a number of good restaurants and shops. The Tourist office is on the way. The best location you may find south of CT and with a very comfortable water temp. You find Boulders Beach very close. Public services such as a health centre within walking distance. Tennis and horse-riding 7 km away. I'm delighted this worked so well for your visit with family. We agree the veranda deck is the best in the neighbourhood! We stayed at Mermaid Cottage for just over a week for our wedding. The location is just perfect & safe with wonderful views over False Bay whilst enjoying breakfast or evening dinner on the fantastic outside seating areas. The cottage is well equipped, the 2 bathrooms providing privacy for all. It was clean & homely with good views of False bay even in the rain. Simons Town has everything you need and Mermaid Cottage is a short walk into the town. Will return & stay in Mermaid Cottage again, fantastic value for money. I'm so pleased it worked for you both, your wedding and guests! We too enjoy the expansive sea view which is enhanced if you ascend the mountain behind, a breathtaking short walk. I hope you managed to see the penguins at the Boulders Beach Colony, though its true they roam lots outside of this, and perhaps enjoyed the restaurants in Simon's Town, they suit a variety of tastes and budgets, we like the friendly Salty Sea Dog right by the pier, reliably delicious line fish. We can arrange transport to and from Cape Town International Airport. We can recommend a dependable hire car service, for car collection at the airport. We can arrange trips to Cederberg on the arid West Coast, kayaking on the Orange River and in West Coast National Park. We can arrange trips to other main cities in South Africa: Durban, Johannesburg and trips to Victoria Falls, Zimbabwe. Closest beach 7 minutes walk is Waters Edge Beach sandy, pretty and safe. Others Indian ocean, ie warmer: Glencairn our favourite! Boulders (penguin sanctuary), Fisherman's and Longbeach, Fish Hoek and Muizenberg - for surfing and swimming. Further away Atlantic side, ie rather colder! Hout Bay and LLundudno for swimming. Scarborough and Kommetjie - for extreme surfers and marvelous sunsets, Nordhoek - for long walks, horse rides and experienced surfers, and Soetwaters - for kite surfing. Cape Town International Airport is 60 minutes by car. We strongly suggest the use of a hired car. Situated 2 miles/20 mins walk to Simon's Town Village with many nice restaurants, harbour tours, boats to seal island. Cape Point National Park - 30 mins scenic drive south. Silvermine Nature Reserve for walking, picnics - 30 mins drive. Cape Town - 50 mins by car (or 70 mins scenic train journey by the sea) for the cable car to ascend Table Mountain, the Waterfront Plaza and boats to Robin Island. The wine growing areas of Paarl and Stellenbosch are 60 minutes drive. Wine is also grown locally. Shopping: 'Seven Eleven' on the main road, 5 minutes walk,and has most essentials. Spar at Glencairn for more. In Simons’s Town and Fishhoek you can buy almost anything. In Sun Valley Pick and Pay at Long Beach Mall you can buy everything. There is also a cinema at Long Beach Mall. Booking Notes: Please contact Elspeth Campbell for availability, price and a booking form. Price range depends on low, mid, high, peak season, number of people and length of stay. Our letting agent in Simon's Town hands over keys for entry and takes a security deposit for breakages/damage to be refunded on day of departure following property check. Changeover Day: Flexible on changeover day. Usually arrival 2-3pm, departure 10-11am, we can be flexible though this depends on the departure and arrival of other guests. Notes on prices: Above price for property in UK pounds. The equivalent in Euros or SA Rands is charged to those who prefer to pay in these currencies. Payment in SA Rands can be made to the agent in SA. A 10% discount is made for occupancy of 3 or less people or for 14 or more nights rentals. The weekly rate is based on 7 nights stay and reduced pro rata, per night, for less than 7 nights. Discounts for long winter lets June to September.